Dog attack injuries are not only physical but also emotional for most dog bite victims and their families. When you or a loved one suffer a serious injury after being attacked or bitten by a dog in San Diego, the trauma may start with nerve damage or even facial disfigurement, but the wounds typically go a lot deeper. Dog bites and dog attack injuries are very serious and can result in permanent scaring, nerve damage and lasting psychological trauma. In young children especially, dog attack injuries often result in lifelong fears that can require years of counseling to overcome. San Diego dog bite attorney, Mark C. Blane, understands that while the factors that contribute to a dog bite may vary, dog bite victims almost universally experience some type of emotional, as well as physical pain. Our law firm fights hard to represent the rights of dog bite victims so they can seek the medical and therapeutic care they deserve. There is a common misconception that only large dogs such as Pit Bulls, Rottweilers and German Shepherds are responsible for San Diego dog attack injuries. This simply isn't true; many dog bite claims originate from smaller breeds, as well. When looking at a dog bite case, it is the actions of the owner that are critical, not just the type of animal involved. Many times, poor training, owner neglect or abuse, inadequate confinement of the animal and/or a failure to warn others of the dog's aggressive nature can be pinpointed as the cause of a dog bite attack. All of these circumstances represent liability and negligence on the part of the dog's owner and our San Diego, California injury lawyers will advocate for you to get the compensation you deserve to address the medical costs associated with plastic surgery, skin grafts and other necessities after a dog bite attack. Typically a dog owner is liable to an individual who has suffered personal injury because of a dog bite or dog attack. A California injury attorney can work to fight for your rights and get you fair compensation for your dog attack injuries. If you or a loved one have been injured as a result of a dog bite or animal attack, it is important that you consult with a California injury lawyer to determine if you have a claim against the owner. A San Diego, California injury lawyer can aggressively represent dog attack victims to make sure that their rights are protected under California injury law. Did you know special rules apply if you have been bitten by a dog and the owner is a renter? 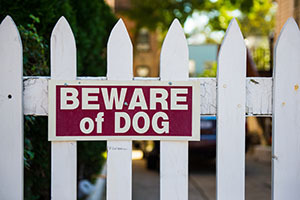 California landlord liability with dog bites is especially tricky and the burden of proof is much higher than compared with the dog bite owner who may or may not have insurance to cover your dog attack injuries. San Diego dog bite lawyer, Mark C. Blane, will make sure you receive the professional representation that you would expect from an experienced personal injury lawyer. California injury law sets very stringent time limits for you to file a personal injury claim, so it is important that you act quickly. Contact San Diego dog bite attorney, Mark C. Blane, to schedule a no cost consultation. There is never a fee unless we recover compensation for you! We invite you to browse our extensive article library, video center, and San Diego injury blog. You can also research your case fur ther by requesting a copy of our California dog bite legal survival book, The ULTIMATE California Dog Bite & Animal Attack Legal Survival Book (which contains the 7 Biggest Mistakes that will ruin your dog bite case and 35 Important FAQs), or our California personal injury guide, The 10 Secrets You Need To Know About Your Injury Case Before You Call a Lawyer at no cost. Hablamos Español.